Vintage Home & Garden: coming soon...I promise! You girls are just the best! Thank you for taking my business card at the shows...and actually using them! I cannot thank you enough for all the phone calls and emails...wondering when the heck I am going to get anything listed on Etsy! I have been working - literally - day and night on all the custom orders I received since the last show. 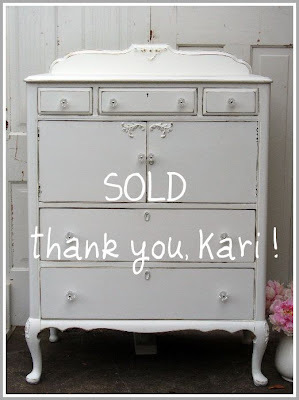 I hope to have the last one, a gorgeous dining room set, wrapped up and delivered by next weekend. Who knows, maybe I will even show you pictures when I get it done! Then I can concentrate on getting photos taken and edited...and finally get some goodies up on Etsy! 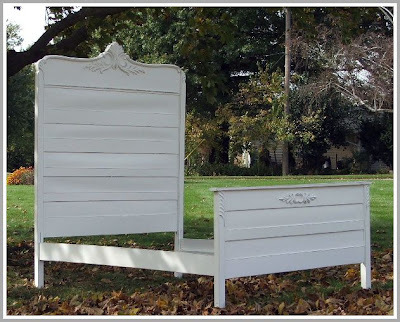 Oh, but I do have a twin and a full size bed up on Etsy now, for those of you that were asking. I know, I know...thats only 3 pictures, but I have a china cabinet calling my name in the other room. UPDATE: Wow! 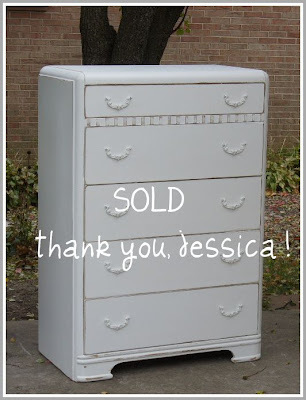 I didn't even get them up on Etsy yet, and the 2 dressers sold! Thank you Kari & Jessica! More to come, so keep watching! I love that you took the photos outside! They look and feel so fresh, just like your furniture~ Gorgeous! Hi Mary - thank you for stopping by our blogs! I am loving your work! Where are you guys showing in IL? We're hoping to have a booth at 3rd Sunday Market in Bloomington sometime in 2010. That's our goal anyway after a spring show. It makes me nervous and excited all at once!! I'll keep checking back for more - you have some wonderful pieces!! Those are great pieces Mary! Those really are gorgeous dressers Mary! Busy is a good thing, right?! BTW, we LOVED the taco soup! It was so good and I will definitely be making it again...so thank you!